It won't rain in Eastern MA until this afternoon (Me-yesterday). Opps. Well I blew that one. Pouring in Middlesex, Suffolk, and Essex counties. The combo surface and water vapor satellite shows the front and upper level low in the Northwest Atlantic nicely. The low is undoubtably helping to feed moisture northward into Southeastern New England as it interacts with the cold front. Here is the 500 mb chart from 2 AM morning. The upper level flow is into Quebec and North of Atlantic Canada. Yet there is convergence from the interaction of the upper level features. That puts New England in a favorable spot for heavy rain and thunderstorms today. I should have seen this yesterday. That said the convergence at the upper levels should subside this afternoon, but a tropical air mass remains in place so thunderstorms capable of flash flooding and lots of lightning will be a threat all day. The short range high resolution guidance suggests Eastern MA is under the gun for storms until later this afternoon before the bulk of the storms shift to Northern New England. For example here is the simulated 8 PM radar. There will be more rain in areas where thunderstorms develop today. There is a lot of moisture in the atmosphere. 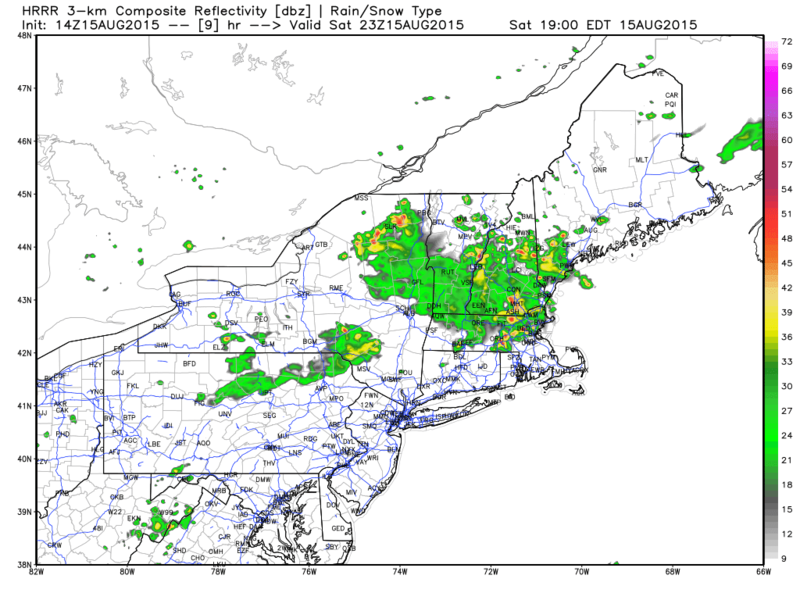 Saturday looks to feature widely scattered showers and thunderstorms. I've been stopped several times this week by people lamenting the forecast for rain all weekend. Yes I expect some rain but not a washout. I wouldn't recommend any camping trips to Northern New England but hold off on cancelling the cookouts and pool parties. Summer is almost over so don't give up on a weekend so quickly. A strong trough of low pressure is slowly moving through the Great Lakes. The system is trying to move towards New England but it is going to be forced up and over the ridge in the Western Atlantic Ocean. Here is the upper level 500 mb chart. 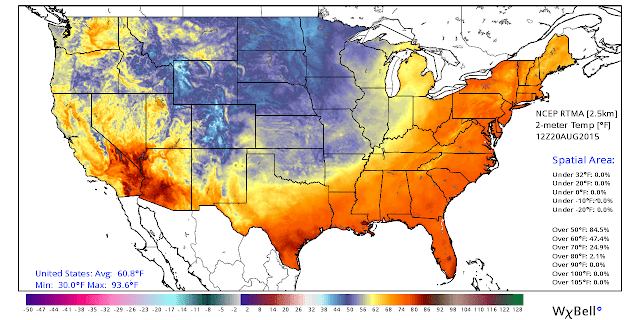 Temperatures are very fall like in the Midwest. Going back to 8 am lets see who can spot the cold front. Fairly easy in this case. As of noon the front has pushed a little further east and south, though not much. The water vapor satellite image shows the two major weather players for Southern New England this weekend and early next week. A large upper level low pressure system is present near Bermuda. This is forecast to slowly acquire tropical or subtropical characteristics over the next several days. It may very well be named Erika before the weekend is over. The cold front that will slowly approach should erode and stall somewhere in SNE this weekend and keep "Erika" out to sea but it may come close enough to enhance rainfall. It will certainly enhance the surf at the shore so heads up if you plan to be in the water this weekend. Precipitation ahead of the cold front works into Western New England before day break. It has trouble getting into Worcester County during the day, but should have no trouble raining in Northern New England. Friday night the front reaches Eastern New England where it stalls/begins to dissipate. Temperatures are in the upper 70s/low 80s. Lower temperatures where it rains a lot. The hard part of the forecast is how much rain falls. The subtropical connection off the coast should enhance the moisture flow into SNE. We have a trigger to initiate convection (the front). Locally 1-2"+ will fall. Saturday appears to be the best day for SNE. On Sunday Eastern MA, Cape and Islands will be at the highest risk for heavy rain as the low offshore makes its move north. On Monday the storm will be at its closest point, but another cold front from the west will move to kick it out towards Atlantic Canada. I had my doubts but the small compact nature of Danny has allowed it to strengthen into the first Hurricane of the 2015 season. Given the overall tropical environment of the Main Development Region this is impressive. The storm faces challenges as it heads towards the Caribbean Islands this weekend but so far it has shown it is a resilient tropical cyclone. Another tropical wave behind Danny has the potential to develop in the next 5 days. By Sunday we could have Danny, Erika, and Fred. Not bad for a strong El Nino year. Happy Hurricane Bob Day! For many it is a not so happy anniversary but it has been 24 years since the tropical cyclone stormed through Buzzard's Day with 105 MPH winds and 12-15 ft of storm surge. Let's look back at Bob and take a look at Tropical Storm Danny way out in the Atlantic. Please see my post from Saturday on my overall late August look at the tropics. 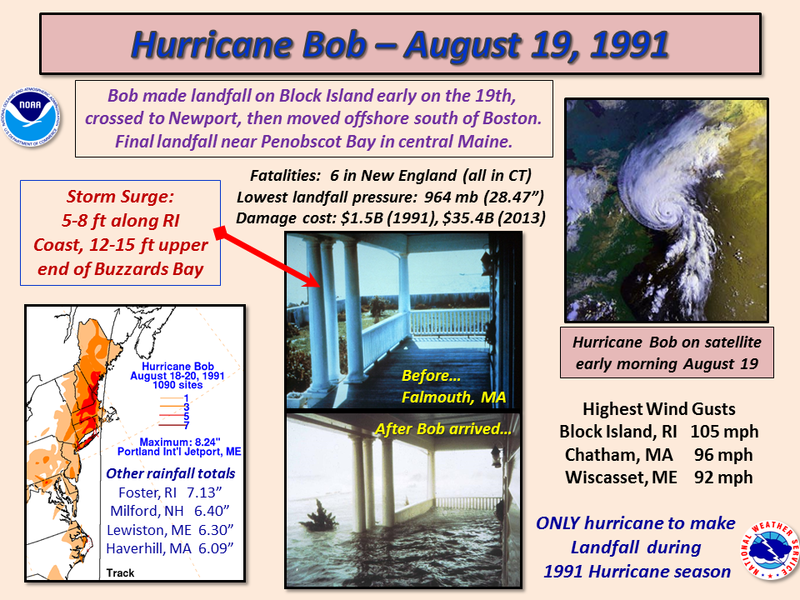 Bob developed in the Bahama's on August 16, 1991. It was spawned by a cold front that exited the East Coast and degenerated. The storm quickly intensified and moved north passing about 35 miles east of the Outer Banks. The forward motion increased as Bob strengthened into a 115 MPH Category 3 Hurricane. Cool ocean waters south of New England prevented Bob from keeping this strength (note- not the case this year see below). Still on August 19 Bob roared into SE New England. East of the center had very little rain but strong storm surge and strong Category 2 strength winds. West of the center saw heavy rain. This is the case with nearly all tropical cyclones due to the counter clockwise circulation. Although we faced considerable impacts from Floyd, Irene, and Sandy New England has not faced a direct Hurricane hit since Bob. Are we due? There is no such thing. It all comes down to a combination of atmospheric/oceanic factors. As you can see in my post from Saturday between 1938-1960 there were 5 direct Hurricane hits, not to mention the extreme flooding from Diane in 1955. Even if the New England hurricane drought continues another 50 years we will always face a threat between August and October. A 2013 report by insurance adjusters, in conjunction with the Great Hurricane of 1938's 75th anniversary, concluded that if Bob hit in 2013 it would have caused $35.4 Billion in damage, compared to $1.5 billion in 1991. The coastline is super developed with valuable property. Buzzards Bay is particularly vulnerable to storm surge. Let's also consider that it took several communities 5-7 days to get power back from Irene. What would a full fledged Hurricane do? Tropical Storm Danny formed yesterday in the open Atlantic Ocean. Winds are currently 50 mph with a pressure of 1000 mb. The NHC thinks Danny becomes a Hurricane on Friday. We'll see but the fact that the storm is small will help. There are some unfavorable atmospheric factors in Danny's way. Some guidance suggests these will subside. First off on infrared satellite the storm does not have much deep convection with it (though it appears to have good structure). The system may be pulling dry air into its circulation. Also wind shear is evident in front of the storm. The water vapor loop very dry air to the north along with strong wind shear. This is typical of El Nino years in the Atlantic Ocean. Let's see where Danny actually ends up in 5 days. If it looks to be heading north of Puerto Rico it is something to really watch. If it heads in the Caribbean I cannot see it surviving the hostile environment there. The shear has been strong all season. The storm looks to be small so the circulation would be ripped apart by the mountains. But again if it can get in the SW Atlantic sea surface temperatures are favorable. I'll keep an eye on it. Enjoy the cooler temps today and tomorrow. Update on the weekend forecast plus Danny tomorrow. Peak of Huricane Season Approaching, Any Action? 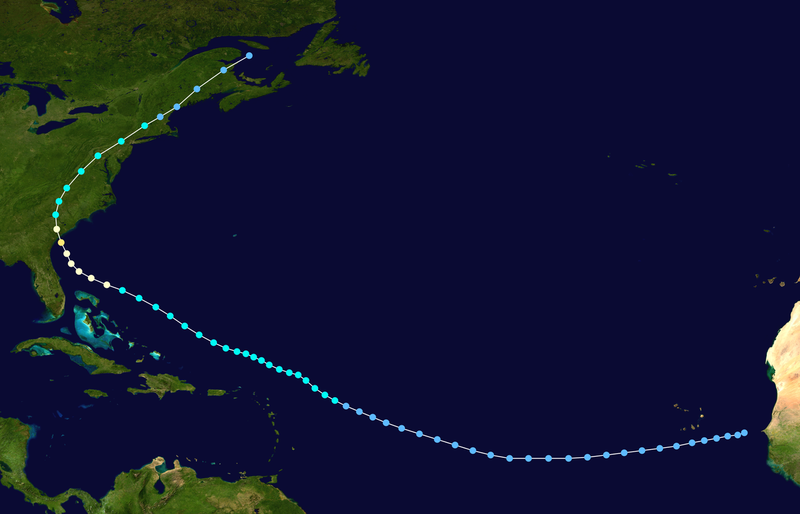 The vast majority of tropical cyclones that impact New England occur in August and September. There have also been a few in October, most notably Sandy in 2012. We have seen impacts in July and November as well (Arthur 2014, Noel 2007) but the highest potential for a strong storm is now. 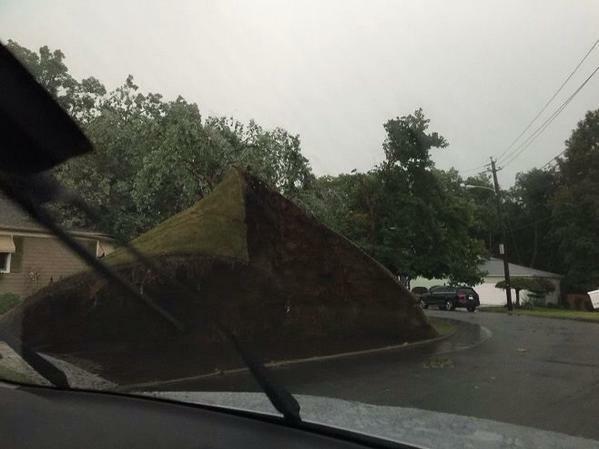 Irene was a tropical storm that dropped tremendous rain on Vermont and its winds knocked down thousands of trees and power lines in Eastern New England. Power was out for 5 days for many areas in MA/RI. 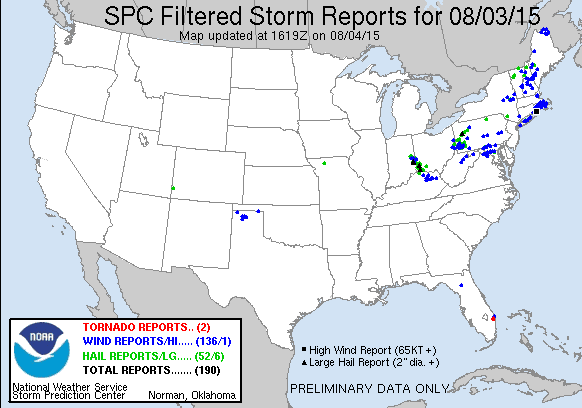 That was eye opening as the past tells us much stronger storms have impacted the region. 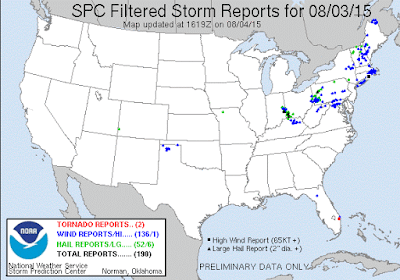 These storms bring a variety of impacts to the region. The Hurricane of 1938 is the GOAT as it hit without warning, at high tide, moving at 50+ MPH with sustained winds of 120 MPH. Here is the NWS Boston's overview of the storm put together in 2013 for the 75th anniversary of the storm. The good news is that nothing in the Atlantic Ocean at the moment is even remotely capable for producing a storm like that. In fact it has been a very quiet season with only 3 named storms. Ana formed in May, Bill in June, and Claudette in July. All of the storms have formed close to land. Why would that be? In the Pacific Ocean a strong El Nino event has developed and that has enhanced tropical cyclone activity in that basin while suppressing activity in the Atlantic. 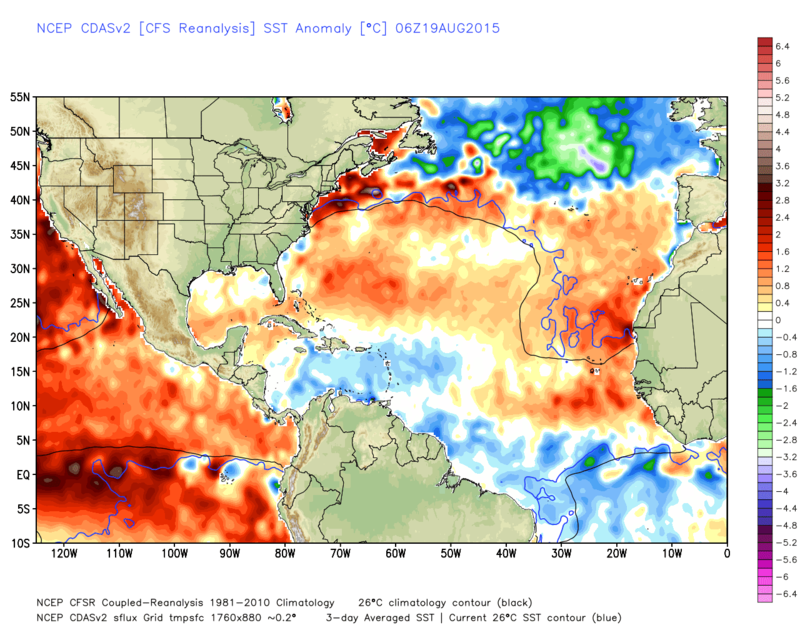 Here is the sea surface temperature anomaly chart. Although the wind shear relaxes a bit in the central Atlantic there is still dry, dusty air out there. The dust comes from the Sahara Desert. There are some waves trying to eat away at this dry air. They will have a tough time but its possible one or two can form into a Tropical Cyclone. In 1997 a major Hurricane was able to form in early September from a wave near the Cape Verde Islands. 1997 was the last time we saw an El Nino event this strong so it works a good analog. Although there are differences, the general appearance remains the same. 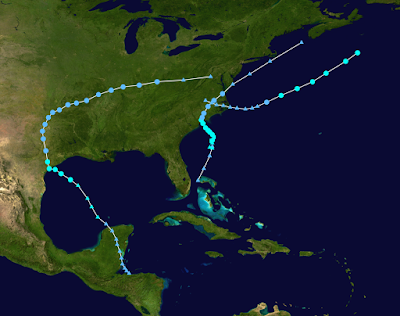 Hurricane Bob was able form in 1991 during an El Nino. 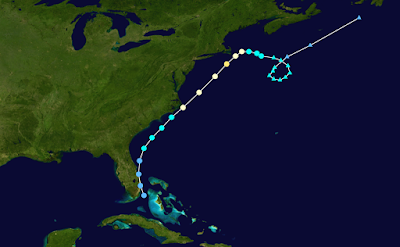 It formed in the Bahama's and strengthened as it moved up the east coast. The weather pattern in week 2 appears to favor tropical development off the east coast and several global models and ensemble products indicate this. I AM NOT PREDICTING A STORM LIKE BOB. I am merely saying there could be "Danny" near the United States in the 6-10 day period. One thing that favors tropical development near the United States is a persistent ridge of high pressure in the NW Atlantic. If some thunderstorms can get under this ridge they are usually blocked from moving anywhere too quickly. Waters are warm near the East Coast so an area of low pressure forms and off we go. The top analog according to the 6-10 upper air pattern is August 27, 1962. We find Hurricane Alma forming in the Bahama's on August 26, 1962. The 1962 Hurricane season was very quiet, much like 2015 thus far. 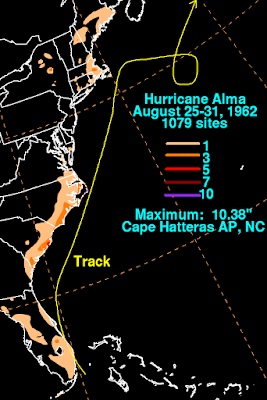 New England was also in a drought in 1962 so Alma brought a lot of beneficial rain to the region. Of course the next analog on the list is August 13, 2002 and no storms are found in that time period. The third date on the list is August 30, 1952. Here we find Hurricane Able which formed from a tropical wave but did not really strengthen until it got under the ridge in the western Atlantic. In summary the Atlantic basin has been quiet which is consistent with strong El Nino events. We are entering the time of year where New England sees its strongest tropical cyclones. The week two upper air pattern seems to favor an atmospheric environment where a tropical system could (should?) form near the US. Just something to keep an eye on. For part 1 of today's post on the heat/humidity please click here. The calender says mid August but it is still summer time. The next week looks to be hot and humid with a few chances for thunderstorms. Despite a soaking rain on Tuesday dry conditions have expanded again and these thunderstorm chances will not put a big dent into the moisture deficit. The Atlantic basin remains quiet thanks it large part to El Nino, but also relatively cool sea surface temperatures in the tropical Atlantic and a drought in the Caribbean. First up the upcoming heat and humidity. A weak cold front will push through New England today but in general high pressure will be in charge. Temperatures today should climb into the upper 80s/near 90. Dew points will climb into the 60s in Southern New England. The biggest threat for thunderstorms will start in Southern VT, NH, ME around 1-3 PM. The threat shifts to Western MA around 4 PM and further east around 5-7 PM. The steering in the upper atmosphere is weak so the biggest threat will heavy rain in a short period of time. This may sound good because we are dry but this type of rain doesn't absorb into the soil as well as a steady soaking day long rain. With the trough not moving completely offshore I am expecting temperatures in the upper 80s tomorrow. It will be cooler at the Cape. This is setting up a very warm Monday as the trough should push completely offshore by tomorrow evening. Southwest flow will set enable a warmer, more humid air mass to invade next week. Monday highs should stay around 90, to perhaps as high as 94-95 in some spots like the Merrimack Valley, or Connecticut River Valley. There is a low probability some could see isolated showers/thunderstorms in the PM. A cold front will be approaching from the Midwest by Tuesday AM. This will help to increase chances for showers and thunderstorms Tuesday into Wednesday though not a washout. The front looks to slow down as it hits the Great Lakes. A developing ridge in Southern Canada and the Northwest Atlantic will prevent the atmosphere from moving anything too quickly through. It is not a very progressive pattern. Picture it like the Mass Pike from Boston out to Framingham. After the Weston Tolls 128/95 merges onto the Pike. Then there is a lane drop another 1-2 miles up. All the volume has to merge from 4 to 3 lanes and it just slows everything down. That's the type of set up we are looking at. There is good confidence in the block according to the relative measures of predictability (RMOP). The finer details can be sorted in the coming days. 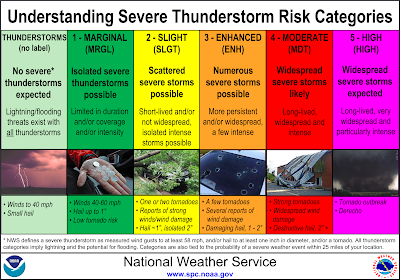 If needed I will post a thunderstorm update for today at the top of the page later on. See Part 2 for more on El Nino and the longer range tropical outlook. In the upper levels the trough is rather shallow, with just a few shortwaves (at the surface the two low pressure systems to the North and South of Michigan) moving under a stronger shortwave in Ontario. Southerly flow will allow for very moist, humid air to enter the region. Upper level winds will also be potent for August so any thunderstorms will have the potential for damaging winds. Still not expecting a lot of thunderstorms with the early rainfall. Pwats (precipitable water) are approaching and exceeding 2' in Southern New England. The mid afternoon will be a period to watch as low pressure may form along the cold front as it pushes through. That will enhance the thunderstorm threat for the 12-6 PM timeframe. This projection would bring heavy rain/thunderstorms to the Cape and Islands tomorrow afternoon so heads up vacationers (let's see if my brother reads this, he is on the Cape this week). The WPC is calling for 1.25-1.5' of rain regionwide and in general this will be correct. Anyone who gets caught in one of the heavier showers/storms will be looking at over 2' of rain in a short period of time. Areas prone to urban flooding will be difficult to navigate if this happens. Guidance has been hinting at a more widespread thunder threat so I will monitor that threat and report an update tomorrow AM. Now another severe thunderstorm watch is up. Keep an eye to the sky, especially North of MA Pike into S NH, VT, and ME. The cold front will not pass until this evening so Southern New England (south of Pike, CT, RI) may get another round of storms later, in addition to anything the might pop this afternoon.